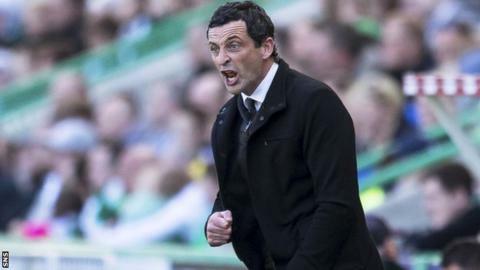 St Mirren appear to have seen off Dundee's interest in Jack Ross with the manager expected to sign a new and improved contract with the Buddies on his return from holiday in Spain. On Tuesday the Dens Park club had a formal approach rebuffed by St Mirren. "I remain focused on continuing to build on the momentum we created last season," Ross, 40, said in a statement. "It remains my responsibility to reward the loyalty of our supporters with a team which they can be proud of." Ross became a target for Dundee after interim manager Neil McCann decided to leave Dens Park at the end of last season. The St Mirren manager guided his team to safety in the Championship after taking over in October last year when they were bottom of the division. "James [Fowler, the assistant manager] and I have put in a lot of hard work already and will continue to do so as we strive to prepare a squad capable of challenging in what will be a hugely competitive and demanding Championship," Ross added. In recent weeks Ross has signed Cammy Smith, who was on loan in Paisley last season, Gregor Buchanan from Dumbarton and Ross Stewart from Albion Rovers. In addition he has renewed contracts for Gary MacKenzie, Jamie Langfield, Jack Baird and Kyle Magennis.